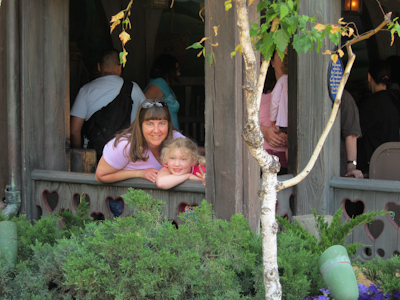 So of all the “dark rides” in Fantasyland, my absolute favorite is Peter Pan. I’m not sure why, really. I love the story for one, but the ride is so magical because instead of a regular omnimover on a ground track, you’re actually suspended on an overhead track giving the illusion of flying. And let’s be honest–when I was little, I actually thought we were flying. 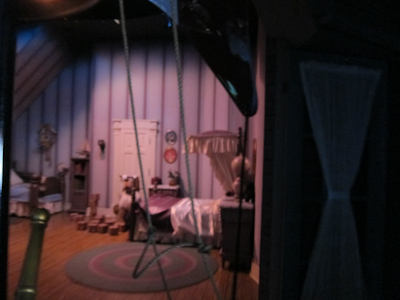 Anyway, the big problem with Peter Pan is the fact that it’s everyone else’s favorite dark ride too. The line is kind of insane. The dude in front of me. 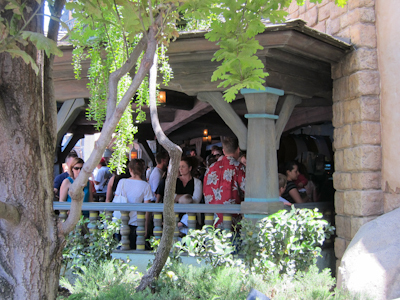 Peter Pan offers switchbacks at their finest. In fact, most times of the year, you zig zag no fewer than twelve times. TWELVE! I have not actually seen Marce in over 11 years. Go figure. 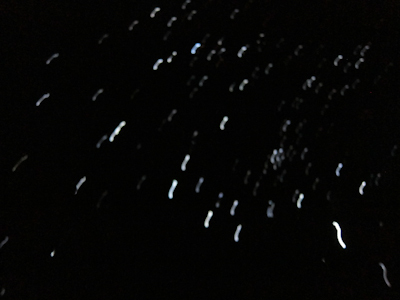 Because I was there with my friend Carissa, and after I got off the ride I complained that it seemed overly dark and we waited all that time and maybe the ride was broken. 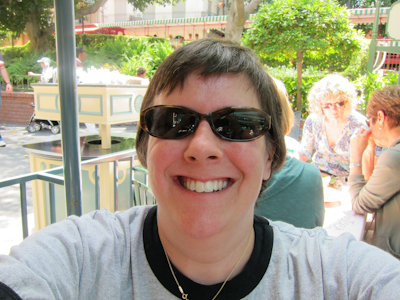 Or maybe I totally forgot and wore my sunglasses ON THE RIDE. Yeah, it’s that second one. Sheesh. 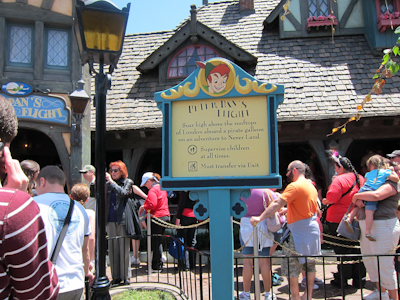 Anyway, one of the reasons Peter Pan gets so backed up is that the ride vehicles are slow-moving and don’t hold many people (unlike the newest dark ride–the Little Mermaid, where the vehicle can seat a family of four). So this is what the back of your pirate boat looks like, which is all kinds of helpful. 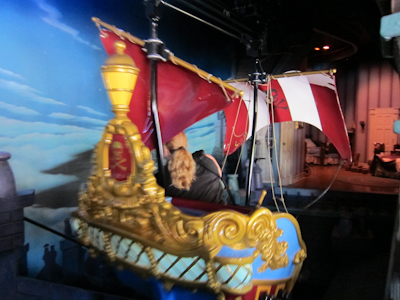 And then, like the typical dark rides like Pinocchio on which I permanently traumatized my toddler, the Peter Pan ride basically takes you through the story. There's the nursery, and who doesn't want a dog as their nanny? If you’re smart and you’re not wearing your sunglasses, this ride is quite enjoyable, if very hard to photograph. And on my way out I caught sight of my friend Marce again! 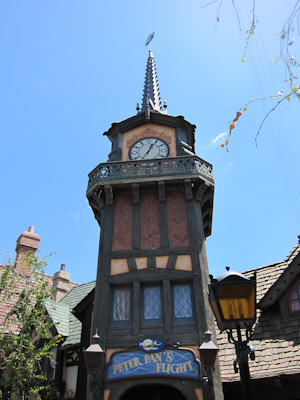 I still maintain that Peter Pan is the best dark ride of Fantasyland (I don’t count small world as a dark ride). If you’d like to ride it, try to hit it first thing in the morning before the line gets big, or if you see a reduced line, hop in. I really do love this ride and I think you will too. I rode it for the first time since I was a kid, last year. I quickly remembered why the line is so long all of the time. Despite the small scale I think it transports you in the same spirit as rides like Pirates. To avoid the line we hung out in Fantasy Land until the fireworks were over so we could quickly get in line. For a ride that’s hard to capture, you did a great job. Thank you! Right after the fireworks is a great time to catch Peter Pan, especially when the hordes exit the park even if it’s still open. Yeah, I totally did the same thing the first time I rode Alice in Wonderland. I couldn’t believe how dark it was! Then the doors opened for the outside part and I went to put my sunglasses on… And yeah. They were already on my face. At least the rest of the ride was easier to see. 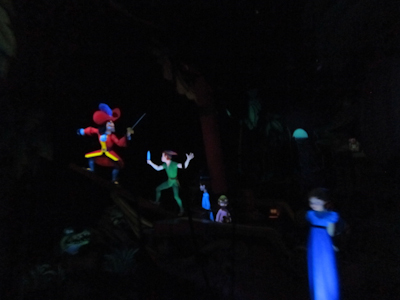 Peter Pan is our favorite dark ride in Fantasyland as well. there are movies of me with my head in my aunt’s lap,wearing my mouse ears and striped pants, weeping, as we exit this ride. i have never been back on….. i did get a box of popcorn (delicious) after, so perhaps it was worth the fright. I must see these movies. Or any of your old movies, for that matter, but the striped pants just make the day. Ceiling fans would be awesome in there! Or something. There’s so little room to route the line anywhere else. And it was very odd seeing my friend! I didn’t even know she was at the park that day. My husband and I rode this yesterday and the line was maybe 20 minutes long and it didn’t wrap around either. I hadn’t been on that in ages (last trip was in 2003) and that was first time husband went on the ride. we both loved it! Oh, a perfect wait! Definitely hop on if the wait is short–it’s such a great ride. Peter Pan is definitely the best dark ride! We do this one at rope drop, then dumbo. You can knock them both out in about 20 mins that way. 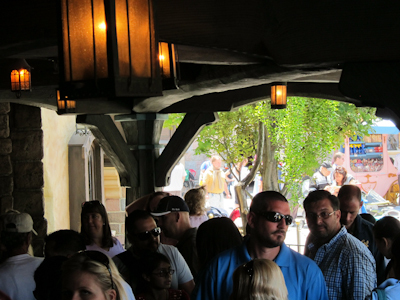 Snow White is the worst dark ride. I kind of wish they’d take it out and put in a rapunzel ride in its place. That would be great! PP is also a great rope drop ride, definitely. They can’t take out Snow White though–it was one of the original opening day rides! 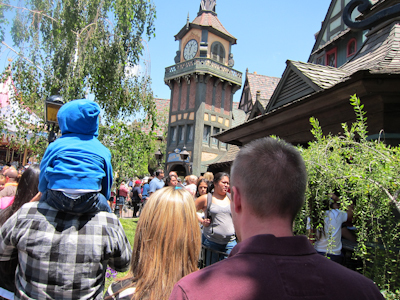 We went to DL this weekend, and I didn’t think we’d be able to ride PP because the line is always so long and we didn’t ride in Friday morning when attendance was light. We lucked out. Saturday morning we headed towards PP after a few rides on the Matterhorn…and the line was only 7 minutes for us (It said 20, but we could tell that was not correct). I was surprised because it was 8:30, and it was a MM so some people had been in the park since 7:00. We only rode PP once this summer (over two trips) during our own MM where we waited about 40 minutes. Hence why we never rode it again. I also really like Alice, and it tends to have a long line too. We rode Alice during the parade on Friday, there was a very short line, and I got a great view of a few of the floats. It is my all time favorite as well. And it makes sense to me that you ran into your friend too. Because well who doesn’t like Peter Pan? Right?